Is the Buggyboard compatible with JIVE² and METRO²? Is the Buggyboard compatible with the JIVE² Tandem? Do you sell a toddler skateboard or platform for your prams and strollers? Is the Buggyboard compatible with the BOUNCE (Legacy Pram Model). Can you use the Buggyboard with the Bassinet configuration? Yes. 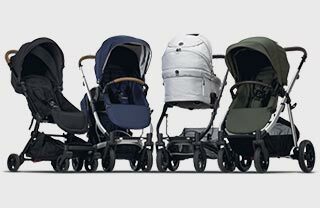 The Buggyboard is compatible JIVE² Platinum, JIVE² and METRO². Apart from the increased weight limit, what are the differences between the JIVE² 12kg Basket, and the JIVE 5kg drawstring basket? How do I contact Redsbaby?